Donald Corenman, MD, DC is an orthopedic spine specialist and surgeon with The Steadman Clinic in Vail, CO. The Steadman Clinic is a premiere sports medicine clinic renowned throughout the world for the treatment of sports and spinal injuries. 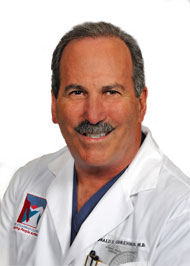 Dr. Corenman started his career as a Doctor of Chiropractic in 1978 and later completed medical school and then residency to become a highly regarded spine surgeon and consultant on back pain. He is an expert in solving complex conditions of the spine and is highly regarded throughout the medical community for his unique manner in which he interprets complicated facts regarding the spine so that they are easily understood by patients and others seeking information about specific conditions of the spine. He is also considered an expert on lumbar spine disorders. Dr. Corenman has been in private practice in Colorado for the past 12 years and is currently affiliated with the U.S. Ski and Snowboard Association and is a physician for the U.S. Ski Team. Regardless of the treatment plans you are offering your patients, this clinical guidebook for back pain will help to provide additional insight into alternative options on how to treat and diagnose back pain, and then manage it accordingly. By being able to answer specific questions confidently and correctly will empower your patients to make educated decisions about their course of treatment.